A dedicated team of techs from Pacific Power Group’s Anchorage office were deep into preseason engine maintenance on one of two day-cruise vessels Phillips Cruises & Tours operates out of Whittier, Alaska, when the M/V Klondike Express returned to port with a faulty injector. 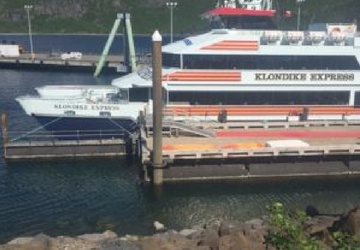 The Klondike Express had finished the first cruise of the year, just hours after PPG had been dispatched to assist with engine maintenance on the M/V Glacier Quest. Phillips Cruises was faced with weekend repairs on the Klondike Express before the Glacier Quest was ready for service. “We were about to start off our season on a very sour note and our reputation with our customers and vendors was at stake,” said Gary Sommerfeld, marine operations manager for Phillips Cruises. Since the 1950s, Phillips Cruises has plied the waters of Alaska giving visitors intimate views of Prince William Sound, Esther Passage and the glaciers and wildlife that inhabit this remote location. PPG has been a longtime partner with Phillips to keep its catamarans running at peak performance. The PPG team is working with Phillips on a repower project, swapping out the engines on the M/V Bravest with two new MTU 16v4000M64 EPA Tier 3 2680 HP engines. The Bravest will join the other two catamarans in the spring of 2019. Given the urgency of the scheduled cruises, our techs quickly redirected their focus from the Glacier Quest to the Klondike Express. The PPG techs worked overnight to make the repairs to the Klondike Express, replacing the injector, and returned the vessel to service in time for its scheduled cruise the following day. The dedication and effort of the techs saved Phillips Cruises thousands of dollars in potentially lost business. Sommerfeld was so impressed with the effort and the work he reached out to Bill Mossey, president of Pacific Power Group, to make sure he knew how important the hustle was to his company. Mossey echoed Sommerfeld’s comments adding that the team’s ability to quickly switch gears and tackle the Klondike’s problem once again demonstrates why PPG is so trusted by its customers. Adventure Bound Alaska has created memorable tours throughout the waters of Juneau, Alaska, for decades – taking adventurers to see the Sawyer Glacier, Tracy Arm Fjord and numerous other breathtaking Alaskan sights. Offering such unforgettable marine tours requires equipment that is capable of sustaining long hours of operation on the water with minimal downtime so passengers can spend more time taking in the sights and less time on the dock. 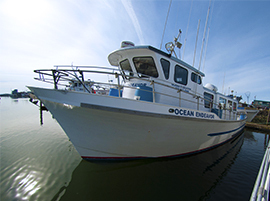 To offer the best Alaskan tour experience possible, Adventure Bound Alaska chose PPG to supply a new Volvo Penta engine to power the tour boat fleet’s newest vessel, the Ocean Endeavor. In order to accommodate the heavy workload that the fjord-bound vessel undertakes, the Ocean Endeavor needed to be refitting with powerful engines that offer enhanced performance and speed. Steve Weber, the owner of Adventure Bound Alaska needed engines that could replace the aging Detroit Diesels in the new Ocean Endeavor, without sacrificing performance. Weber was looking for engines that offered reliability, maximum uptime and greater power availability. These factors would allow his new vessel to accelerate faster and operate for longer hours – meaning longer uninterrupted tours for passengers. Having worked with Pacific Power Group’s Marine team in the past, Weber was confident that PPG would supply an engine fit for the heavy operational hours of his new tour boat along with reliable service and support. PPG’s team supplied the Ocean Endeavor with two Volvo Penta D11-510 engines that are designed to deliver better day-to-day reliability. The reliability that these Volvo Penta engines offer will permit operators of the Ocean Endeavor to take passengers on full-day tours, meaning entire days of Alaskan wonder and sight-seeing. With travel logs that often exceed 140 nautical miles per day, this Volvo Penta engine ensures that the newly repowered Ocean Endeavor is properly powered to support the 33 percent increase in passengers on the new vessel that will be taking to the scenic waters around Juneau, Alaska.